Cynthia Kaplan inspires instant fandom for her smart subversiveness. Though she also goes by Cindy and has blonde curls, she would eat that Brady Bunch Cindy for breakfast. We invited her to be an Ideasmyth Featured Creative during our Interdependence month because I see her as a multi-genre cross-pollinator and master collaborator. She’s got a really rich bio for one young dame. This week, enjoy your daily dose of Kaplan’s darkly funny career highlights embellished with creative process backstories. There was a time when humor pieces appeared on the Times Op-Ed, page. Over the span of a couple of years, I wrote about things like President Clinton’s puppy, coin collecting, dogs and drinking fountains. My last piece for the page was the story of the day we put my grandmother in a nursing home. It happened very suddenly and was, perhaps, the most violent act in which I have ever participated. A space became available and we had to grab it or risk waiting maybe six or eight months for another. I don’t know why I thought there would be more warning. It’s not like they call you up and say we’re expecting Mrs. Feingold to sign off in about two months so you should start to get ready. Mrs. Feingold or whomever just dies and they clean up her room and they call you. That’s it. So my parents and I packed up my grandmother’s winter clothing, a few pictures and books and some of her music, and tore her out of the ground like a mandrake root, and although she came willingly the silent scream was there, not so silent; I could hear it, we all could. Despite our best efforts to prepare her, there was no way she could have known what was happening. And despite our best intentions, here is what was happening: Come, put on your coat, get in the car, you will never see this place, your home, again. Sorry, sorry, sorry. At first she was excited. She was finally out of the apartment, out and on her way to, where? Well, to the good new place, we said. To the place near mom and dad. With a piano. None of us could say nursing home. But then after a half and hour in the car she stopped wanting information and started wanting soup. When we got to The Place everyone gave my grandmother the big welcome. They gave her soup. They gave us all soup. We walked her around the common rooms and garden, which were beautiful. Nurses and aides and administrators made a fuss over her, which she loves. She was bubbly and charming and spoke nonsense and everyone thought she was adorable. My parents and I made furtive eye contact; it was going so well, but still, all I could think was: Just wait. 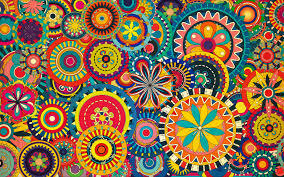 How’s this for psychedelic flower-patterned wallpaper? We went to her room or rather, her half room. 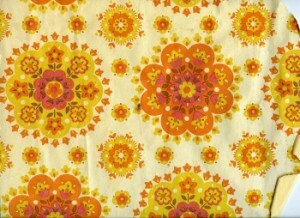 It was small and the wallpaper was a psychedelic flower pattern that it seemed to me could itself induce dementia. The furniture was old and the bed creaky and hospital-like. I went out into the hall and cried. There was a roommate who was incensed to find people in her room. We drew the curtains that divided the space. At least my grandmother had the window half, looking out onto the garden. At least, at least. She had not shared a room with anyone besides her husband in seventy years. Now she was going to share it with a mean stranger. I went into the hall again and cried. My grandmother was taken off for evaluations of some kind. We waited in her room in a state of what can only be described as wistful dread. Surely the other shoe was going to drop. It did. My grandmother returned distraught, furious. She hates to be poked and prodded and questioned and she was ready to go home. She said: Get me out of here. You have to take me out of here. I’ve had enough. You can just kill me if you want but I won’t stay here. I’ll just lay down on the floor. That’s all. I’ll just lay down on the floor and die. Now we had to explain to her why she wasn’t going home, why she had to stay tonight, and maybe for a while. We didn’t mention forever; what a ridiculous, damaging concept that is. My father left the room for a few minutes, maybe to figure out what would be the best thing to say, maybe to cry. While he was gone the roommate poked her head through the curtain and said, “It’s a nice place, really.” But my grandmother was inconsolable. My father came back and said quietly, “Mom, you have to stay.” That was it for me and I went back out into the hall. Somehow, a few weeks went by. At least one of us has seen her every day, even though she doesn’t always know who we are and will probably not remember that we were there. We walk with her in the garden. We sit and people-watch. We talk her into playing the piano in the lobby. (She complains that it is not as nice as hers and she’s right.) We have endless conversations with her aid and nurse and social worker so they’ll know what she likes and doesn’t like, who she is, so they’ll understand her. My brother has come with his children, and even my mother-in-law, way above and beyond the call of duty, has visited. She is still very confused by her surroundings, calls everyone names behind their backs (actually, she barely waits until they are out of view, much less out of earshot) and thinks the social worker is someone she knows from the beach. Sometimes when we arrive she seems alright, sometimes she collapses into our arms, lost and distraught. Each day she takes her clothes out of the drawers and the closet, folds them beautifully and packs what she can into the small straw bag I brought for her piano music then leaves the rest piled on the bed and dresser. She carries her pocketbook everywhere and sometimes tries to go out the emergency door. She talks incessantly of going home (who wouldn’t? ), of getting on the train she sometimes hears in the distance and going back to her apartment. This will change, we know. In time she will make friends and have activities. (Okay, she’ll never have activities, she hates activities.) She will be cared for around the clock by professionals who are trained to meet the needs of people with Alzheimer’s. We tell her: Stay for now, stay for the winter, it’s better, safer, warmer, whatever. We tell her what we hope she’ll understand. But she is planning a break-out, I think. Dear Sarah, (Who?) Send help. I need help. Help please. She has written this on a paper towel and put it in her pocketbook. She is our hostage. As I said, it feels like the most violent act in which I have ever participated. I would take it back, if I could. ~~~Cynthia Kaplan is a comedian, actress, and the author of two acclaimed collections of comic essays, Why I’m Like This: True Stories and Leave the Building Quickly. 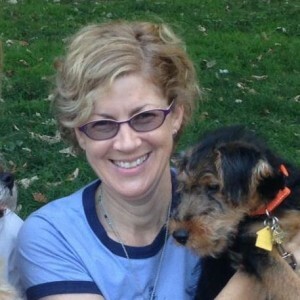 She has been published in newspapers, magazines, and humor anthologies, and has written for both film and television. She has performed her comic works at Naked Angels, The Atlantic Theatre, Moonwork, and Dixon Place among many others, and has appeared in many plays and some films. She co-wrote and appeared in the indie favorite Pipe Dream, starring Martin Donovan and Mary Louise Parker. She was the co-creator and co-host, with Nancy Giles, of the long-running New Jack Paar Show at the West Bank Café. 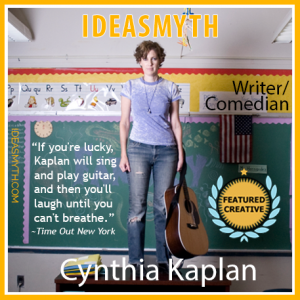 Her band, The Cynthia Kaplan Ordeal, has played in theaters and rock clubs throughout the country, including NYC’s Joe’s Pub, City Winery, the Cutting Room, and The Kitting Factory. The band recently released its first album, FANGRY, whose songs have won prizes in international song contests and whose video Merry Christmas to You! was voted a top Christmas video on funnyordie.com. Her newest video, We Were the Donner Party, is headed to the Acme Comedy Festival in LA this month. She writes plays and songs for the 52nd Street Project. She has never appeared on Law & Order. 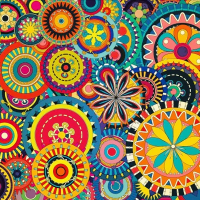 Posted in Branding Ideas, Communications, Featured Creatives, Good Ideas, Inspiration, Interdependence, Performance Ideas, Writing and tagged aging, Better Safer Warmer, comedy, comic essay, Cynthia Kaplan, Featured Creative, Interdependence.